Blue Ridge Road is closed for the winter, and this campground is walk-in only. 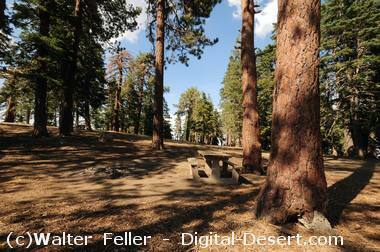 Primitive tent camping site overlooking the Sheep Mountain Wilderness Area. No water. Vault toilets. Adventure Pass required for vehicles parked at this campground. Campsites are first come - first served. Location: Located on Blue Ridge Road 6 miles from the intersection of Blue Ridge Rd. and Angeles Crest Highway (the intersection is 1.5 miles west of Big Pines). The road into the campground is a rough dirt road - after the first 5 miles a four-wheel drive is required. Groceries and services available in the community of Wrightwood (approximately 9.5 miles). Call (661) 296-9710 for current conditions and additional information.